This morning while checking the comments on this blog I was surprised at the amount of spam comments caught by the Akismet plugin, so I decided to dive in with some logfile analysis using R to see if I could lessen the scourge. Grab the data from my nginx logs, since I get very few comments, we can assume that everything is spam. This shows that there is no single IP causing all of the trouble, so there is no simple solution of blocking a single IP. 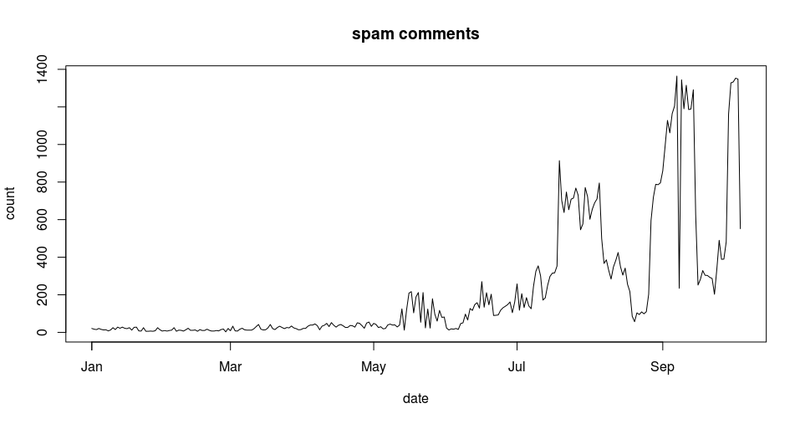 Graph the number of spam comments per day. Note: Since I sat down to write this post after clearing out the spam comments I now have 101 new spam comments.